However, as in the famous Indian legend, in order to truly know what an elephant is, you have to be able to perceive the elephant as a whole. Comprehensive energy retrofits are designed to consider the whole building as an integrated system of interacting sub-systems, and, as depicted in figure 1, optimizing these sub-systems together offers the greatest opportunity for saving energy. 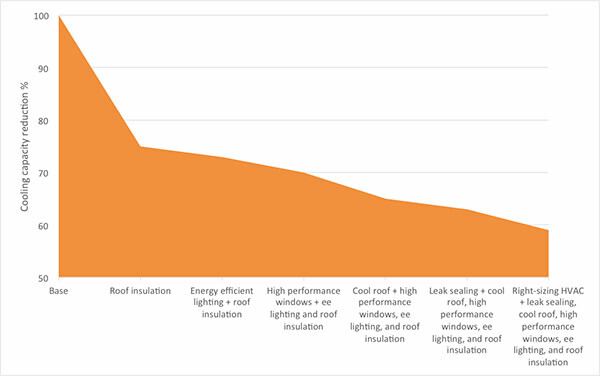 A new report from ACEEE analyzes retrofit programs that encourage a whole-building approach rather than standard preapproved or prescriptive efficiency measures. After reviewing over 25 programs from across the nation, we created recommendations for pathways that program administrators can adopt to increase their market penetration and improve the program outcomes. Figure 1. How savings increase with the installation of every additional measure. Source: Integrated Building Design (EDR 2006) based on California Energy Commission Pier Building Program. We found that the market for commercial building retrofits is growing and there is a huge potential for program involvement. Leading programs have innovatively designed incentives that encourage deeper savings. In addition to monetary incentives, we observe that programs providing streamlined, end-to-end support tend have more satisfied customers. Effective programs not only help identify savings, but also take the extra step to help procure funding, provide technical assistance, and offer incentives for ongoing optimization. We also found that exciting developments at the intersection of information technology and energy efficiency have enabled access to granular, real-time energy-use data and advanced analytical capabilities. Software solutions utilizing these data and capabilities are creating new opportunities for whole-building assessments, identification of comprehensive savings, and automated monitoring and tracking of energy-systems performance. We believe that advanced data analytics has the potential to help scale up and prioritize the pool of prospects for comprehensive retrofits. While most programs have traditionally focused on the largest commercial customers, smaller commercial facilities such as restaurants, nursing homes, clinics, and warehouses tend to have similar energy-use characteristics within their own segment and are promising prospects for efficiency programs. Such niche customers are often driven by competitive pressures to improve their operations, and are thus highly receptive to program incentives. Finally, we underscore the need to align program benefits with the business mission of the customer. Efficiency retrofits provide many non-energy benefits such as health, safety, comfort, and productivity improvements, in addition to the energy savings, which can help businesses achieve their primary institutional mission. Call it the “whole elephant” method.